Are you looking for some quick, easy and fun methods for baking fish? And to get the best use out of your favorite fish recipes? Are you ready to bring a little more excitement into your kitchen? There are several different baking methods and techniques that can be used for cooking fish in your oven. You can sauté and roast, also known as skillet-roasting or sear-baking. Using an oven proof pan over medium-high heat on the stove, sear the fish on one side with the skin side up, if you are leaving the skin on. Then turn the fish over and immediately place it into the oven at 450° until it's done. The searing creates a flavorful seal and a nicely browned exterior. This helps the fish to remain moist and tender inside. The heat source in a broiler is generated from the top, instead of throughout the radiated walls of the oven. This baking method will cook the top of the fish to a beautiful golden brown while keeping the underside moist and tender. Planking is another variation of oven-roasting which creates a moist, subtle flavor that is remarkable and not overpowering. 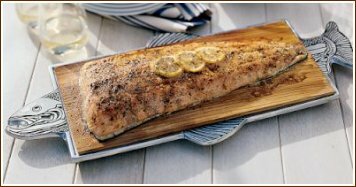 This is one of those great versatile baking fish methods that can be used in the oven and even on a grill. The fish is placed on a lightly oiled wooden plank, usually fresh aromatic types of cedar or almond wood. After preheating the oven to 450°, place it on the center rack and immediately turn down the temperature to 375°. Cook until it's done and serve immediately. Oven frying is very similar to deep frying fish and pan frying fish, except that the fish is placed on a cookie sheet and baked in the oven, without all the fat. You can also use a baking pan if you choose to. To begin, lightly oil a cookie sheet or spray it with nonstick cooking spray, lay the fish on the sheet, then place it in the oven at around 450° to 500°, and bake until it's crisp and golden brown. You can prepare and cook the fish in a few different ways of your choice. You can drizzle the fish with melted butter or margarine, dip them in an egg mix, or dredge them in a breaded coating. En papillote is a french term used for cooking in a paper case, such as parchment paper. This is a method of steaming fish and vegetables that is securely wrapped in parchment paper. It can be cooked over boiling water or baked. The paper keeps in the moisture and steam created from the fish's own juices as it cooks.